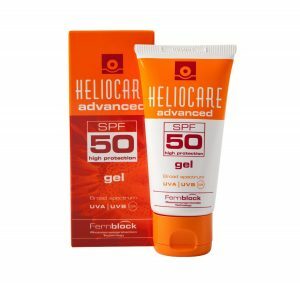 Heliocare SPF 50 gel is an excellent sun block for all skin types and colours. It is non greasy, easy to apply and is not noticeable on the skin like other branded sun blocks. The consistency of the gel means it rubs straight into the skin, does not leave any residue and is perfect under makeup. Heliocare SPF 50 gel is perfect if your skin is sensitive to the sun and is mainly used for the face, but can be applied to hands, neck and chest area too. This sunscreen is also suitable to use with your current skin products. Heliocare SPF 50 Gel is oil-free, easy to apply, has a light to the touch formulation. It is ideal for all skin types and particularly suitable for oily and spot-prone skin. Apply in the morning to complete your anti-ageing skincare regime or as directed by the aesthetic professional. Gently massage until absorbed ensuring complete coverage of the face and decollete. Non-comedogenic and water resistant reply every 2-3 hours during periods of sun exposure.